To view the My Current Tasks record viewer, select Utilities > CRM > My Current Tasks from the TeleTracker Online menu bar. 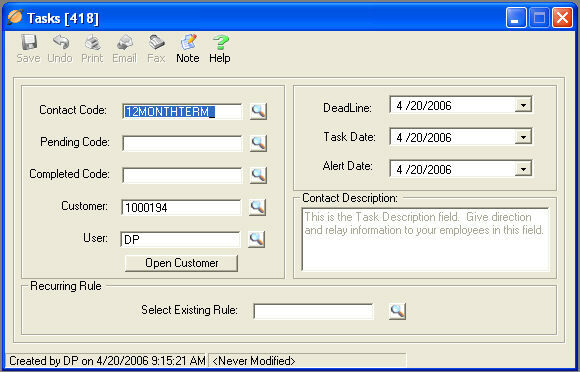 The Current Tasks record viewer will display tasks based upon the configuration of the Task Toolbar. Open : Select a Task from the Task Transaction Viewer. To open the Task, double-click or click the Open icon in the Task Toolbar. Delete : Select a Task from the Task Transaction Viewer. To delete the Task, click the Delete icon in the Task Toolbar. Move : Select a Task from the Task Transaction Viewer. To assign the Task to a different TeleTracker Online User, click the Move icon in the Task Toolbar. The User Lookup window will appear, as seen below. Enter the desired User ID or perform a search for the User by clicking the Lookup button. Click the OK button to assign the Task to the selected User. Snooze : Select a Task from the Task Transaction Viewer. To postpone the Task, click the Snooze icon in the Task Toolbar. The Snooze Time window will appear, as seen below. 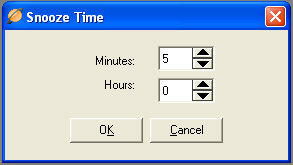 Enter the desired minutes and/or hours to postpone the Task. Refresh : Click the Refresh icon in the Task Toolbar to refresh the task transaction viewer. View : Click the arrow next to the View icon in the Task Toolbar to change the view of the Task transaction viewer. List of Current Alerts: This view shows only the Task alerts for the current user logged into TeleTracker Online. List of All Alerts: This view shows all Task alerts for all users in TeleTracker Online. Calendar By Task Date: View Task alerts in a customizable calendar view. View All : Click the View All icon in the TeleTracker Online Toolbar to see all Tasks for all users in TeleTracker Online. Transaction Filter : View select Task based upon the Task status. Show Pending: Show Tasks that have been populated with a Pending code. Show Completed: Show Task that have been populated with a Completed code. Select a Task from the Task Transaction Viewer. Double-click the task or click the Open icon on the Task Toolbar. The window above is what the TeleTracker Online User will be presented with. Each individual task contained within the Task Transaction Viewer will contain information and/or instructions for the TeleTracker Online user. Contact Code : The Contact Code will automatically populate upon the creation of the Task. The Contact Description is generated from the Task Definition that is populated in the Contact Code field. Pending Code : When appropriate select a Pending Code. Use the Pending Code to identify that action has been taken on the task, however the task has not been completed. Completed Code : Select a completed code to identify that the Task has been competed and no further action will be taken. Customer : This field identifies the customer to be contacted. User : This field identifies the User to which this task is assigned. Open Customer : Click the Open Customer button to view the Customer Master File. The Customer Master File will contain all necessary contact information. Deadline : This is the date the Task must be completed. Task Date : Date the Task was created. Alert Date : Date the assigned User is to be alerted by the Task. Contact Description : The contact description will give direction and information to the TeleTracker Online user. Recurring Rule : Select or create a recurring rule for this task. Please visit the Recurring Task Rule help file for setup information. When applied, this Task will be created in accordance to the configuration of the Recurring Rule.